Here at St Thomas More we have a wide range of performing arts opportunities. Children across all age ranges have the chance to take part in drama, dance and music lessons and activities. 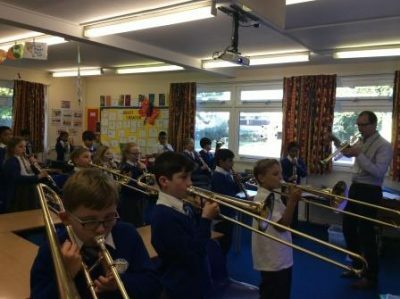 All children in Year 5 take part in First Access music where they learn an instrument on Wednesday mornings with Gemma from the Oxfordshire Council Music Service. They learn either a clarinet, cornet, trombone, or baritone. They have been learning the basics of their instruments and reading music. As they progress, they will play increasingly difficult songs from a wide repertoire, including children’s music, jazz, and classical, as well as popular music. The children practice all year and perform in assemblies and concerts. The children also then have the option to continue with this in Year 6 if they wish. Instrumental teachers also visit the school on a weekly basis to teach various different musical instruments to children in the school. The children benefit a great deal from these lessons and go on to become very successful in their chosen instrument. Children throughout the school take part in dance sessions both in PE lessons and in a variety of clubs. The children work hard at learning routines and really enjoy performing the finished product to other children in the school and sometimes parents too. The school choir performs at many different venues throughout the year. They rehearse hard during the school day. At Christmas the choir performs Christmas carols at local residential homes and return in the summer term to perform songs they have learnt throughout the year. Christmas time is always a busy time of the year for all children in the school. All year groups perform either a nativity play or a carol service and concert to parents and other year groups. Later in the year the children in Key stage 2 also have the opportunity to perform in various productions too. The children in the choir have the opportunity to perform at Dorchester Abbey in the national festival of voices. This requires the children to learn a number of songs during the spring term and work hard on memorizing all of the words. They then join many other schools in the Abbey to perform to their parents in a fantastic concert. Year 5 students participate in a drama course run by the Oxford Playhouse. Paul comes in each week to teach both acting and script writing. The students have lots of fun and always look forward to his weekly visit. Over the term we have seen a marked improvement in confidence, self-esteem and expression of thoughts and feelings. The students have been writing plays based around holidays and celebrations such as Christmas, Easter and weddings. We have seen wonderful work so far and over the next few sessions children will complete their plays and perform to the class. Most exciting is the performance in March, when several plays written by the students will be performed by professional actors in the Oxford Playhouse.